Last week I went down to Somerset for a tour of the Hills to Levels Project across the catchment. 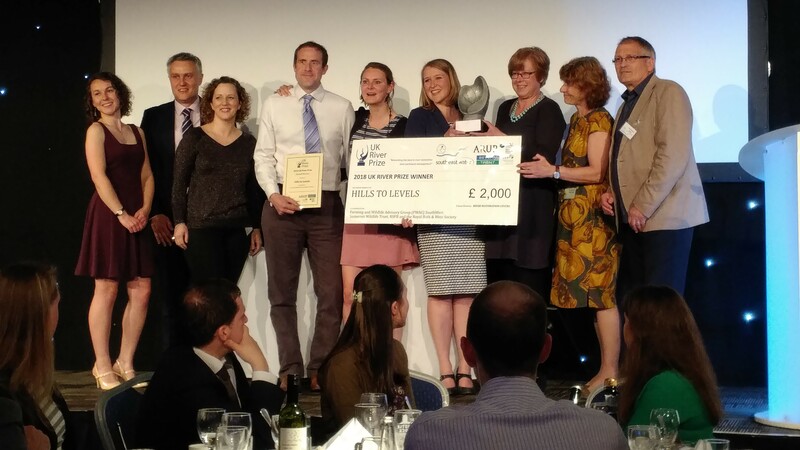 Hills to Levels was the winner of the UK River Prize 2018, and winner of the catchment-scale category. The long drive from Bedfordshire (180miles!) was totally worth it to see the work that has been going on down in the levels. The group met in Merriott where Joanna Uglow from FWAG South West gave a short introduction to the project and the sites we would be seeing. We divided into fewer cars to make our way to the first site – a project to reopen a culvert running through a field. Sabine McEwan from FWAG South West explained how as far as they knew, the culvert had always been there possibly for a mill or to provide a water supply to a nearby farm house. The culvert currently runs beneath the farm land, and is creating a health and safety risk as the land is slumping into the watercourse below. There are large steps and a waterfall dropping down into the culvert, which is silted up from slow, low flow. This culvert site shows great potential as deculverting would allow the stream to be opened up, providing a natural meandering planform, slow down the flow, improve fish passage, and create the opportunity to plant trees and enhance habitat. The culvert is owned by the district council who contract out the maintenance work, however the structure is not well maintained. The culvert screen can become blocked by litter, resulting in the channel occasionally overtopping the bank. This shows the importance and difficulties of long term maintenance. 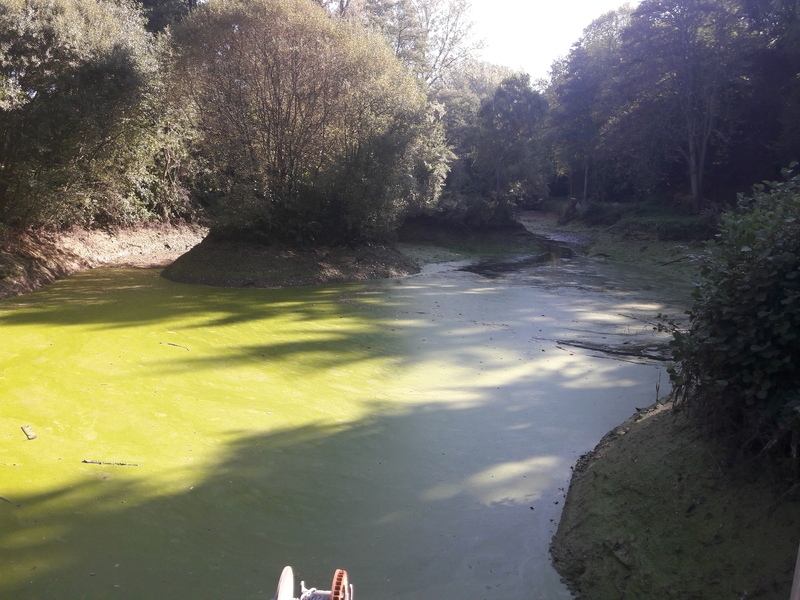 This is a similar issue with Natural Flood Management (NFM) structures which need to be maintained following implementation, therefore there needs to be clearer plans in place explaining who is responsible for upholding functioning structures in the catchment. 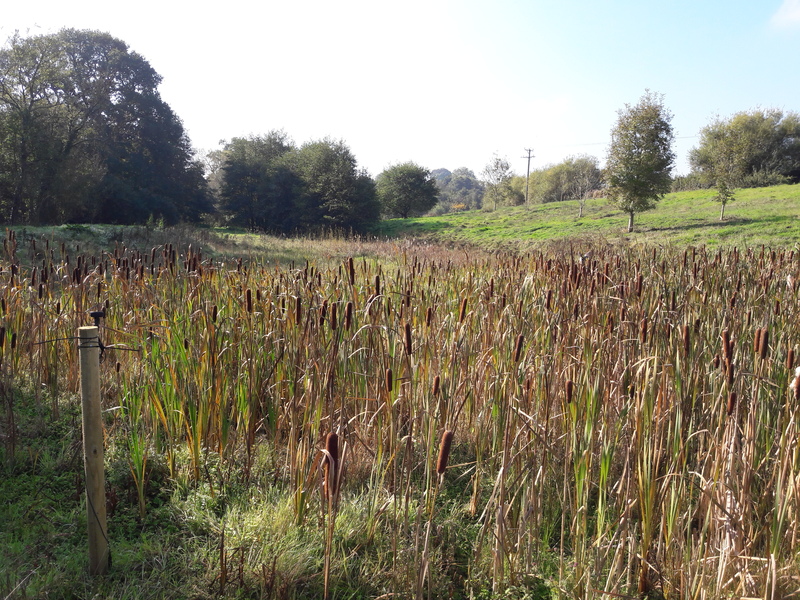 The second site introduced the group to constructed floodplain storage at Marks Barn Farm in the Merriott catchment. At this site monitoring equipment was put in place as the scheme will be revisited to assess success. Techniques used here included floodplain spillways and wildlife ponds used as temporary flood water storage. Coir matting and VMAX geotextile were used on the bed and banks as a physical barrier to uphold the channel structure. Water depth loggers are being used to collect data on water levels, with some utilising Bluetooth technology for data collection. Sabine explained how this technique was beneficial as sometimes the high water levels prevent access to the equipment for data collection, and also removing and subsequently replacing the monitoring equipment may not position the logger back at exactly the same level, resulting in a sudden jump in the resulting data. At this site these loggers were used to compare the head of water in the wildlife pond and the spillway to see if the levels were changing. This is a cheap method compared to collecting flow level data, and can still be collected once every minute, generating accurate, continuous results. Sabine and Joanna explained how Catchment Sensitive Farming such as these techniques to take land out of grassland, creating temporary storage, and slowing the flow to help reduce flood risk, can financially benefit the farmer or landowner. Walking back through the farm discussing techniques and ideas, the group then moved onto the next site. 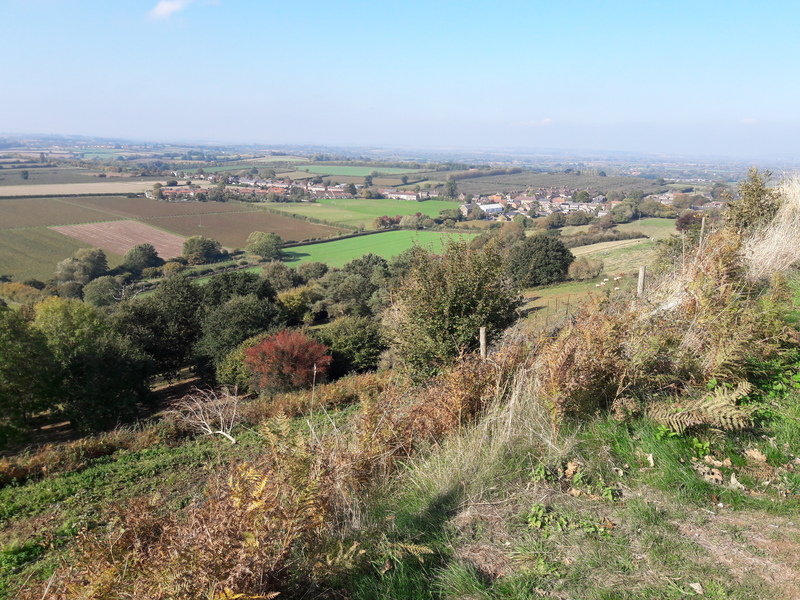 Ham Hill, in the upper part of the River Parrett catchment, provided a stunning view of the catchment, helped by the clear skies and sunny weather. Over lunch and a cup of tea we admired the view and discussed what projects we are working on, before moving onto the next site at Manor Farm, Loughton. We were joined at Manor Farm by Roy Hayes who works as catchment officer for the Hills to Levels project, and Gordon Swindle, a Flood Warden at nearby Martock, and advocate for this project to slow the flow and avoid flooding. With the upcoming development of 3,000 homes being built in nearby Yeovil, there is massive potential for quicker and increased runoff. 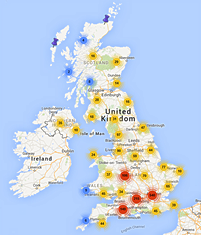 Any attempts to slow flow and reduce flood risk would be welcome. At this site, three catchment ponds are linked and lead back to the main watercourse. Existing field bales have been used as a filter system for runoff and debris dams have been built to temporary store water but still allow flow downstream. Roy emphasised the importance of local volunteers such as catchment partnerships and warden schemes to overcome the hidden costs associated with NFM. Designing and constructing structures can seem quite logical, straight-forward or cheap, but finding contacts and advice for continued maintenance can be costly and sometimes overlooked. Roy and Gordon mentioned a few caveats including how there is a need for flow level measurements at this site for monitoring and assessment of methods. Currently these figures are estimated, but soon the University of Bristol will have a PhD student looking at starting monitoring here to gather data for the future. Secondly, Roy raised the issue of how building a debris dam is not the final answer or the end of flow risk management. These structures need to be managed and maintained, and we need to encourage volunteers to monitor these structures and report to local authorities when maintenance is needed. The group discussed options for improving engagement in local communities, including the idea of using current community groups such as rambling groups, sports teams and the University of the Third Age. Thirdly, the group identified the point of whether or not there is a need for a rigid definition of NFM. The alternative option was put forward to having an NFM scale on which to judge a method, from hard engineering techniques, to Green Infrastructure methods. In some cases a combination of a number of techniques both hard and soft, can be considered best practice NFM, making it difficult to create an exact definition for NFM schemes. 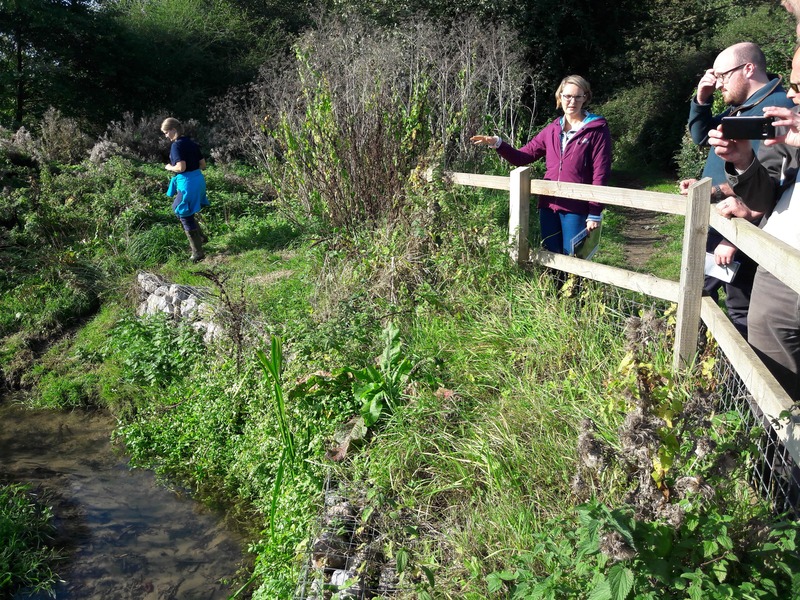 The recent growth of NFM as a restoration technique shows how small, headwater systems and tributaries in small communities can make a difference to local flood risk, illustrating how these projects would benefit from local engagement. 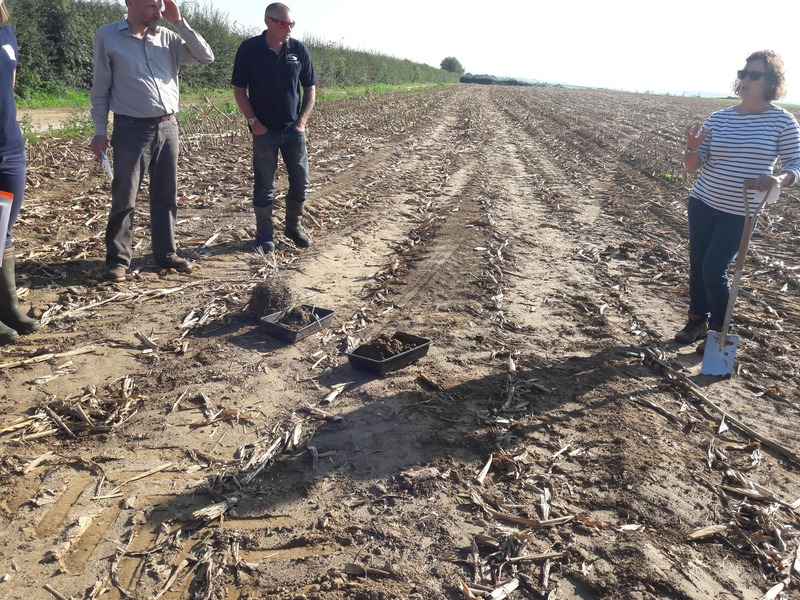 The final site of the tour was to Wigborough where we were met by soils specialist Jo Oborne from FWAG South West, to learn more about soil structure and land management. Jo outlined the detrimental impacts of overworking soils, as farm machinery can compact soils reducing water storage capacity, reducing pore space which impacts germination, and limiting nutrient utilisation. Reducing compaction can help farmers improve yield. The local catchment provides light, fine, easily erodible, fertile, sandstone soils for agriculture. In this field, the Grade 1 soils are suitable for growing a diverse range of produce including maize, potatoes and vegetables. The dry year and overworking of soils can influence soil slump and erosion. 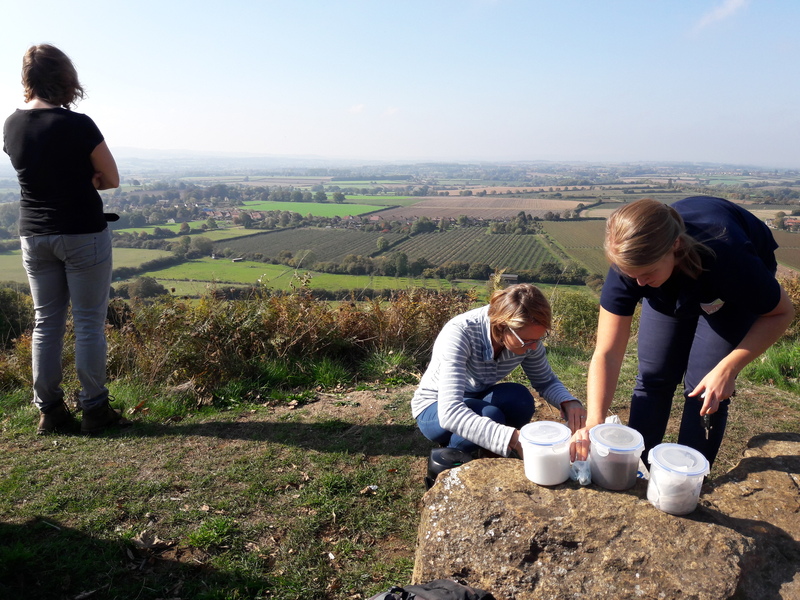 Previous assessment and initial observations of the field soils led to suggestions for soil management, including crop rotation and planting a cover crop to create a canopy to intercept the impact of rainfall and provide roots to stabilise soil structure. Another method to alleviate this issue is to lift the soil upwards using a subsoiler to loosen the soil, increase pore space and encourage vertical cracking to replenish aquifers. These hard worked soils could benefit from increased organic matter input or the spreading of manure to improve energy of the soil. Where compaction is so tight that water cannot infiltrate the soil surface, edge of field methods can be useful, such as coir rolls to capture soils running off the land. This not only generates a visual representation of the volume of valuable, non-renewable sediment being lost from fields, but also provides material that can be used on fields again in a couple of years to replenish soil nutrients. Other methods include compost filter socks and filter fences, which can help to slow, capture and disperse silt. Jo also pointed out the difference in soil types from the field and the hedgerows. The soil directly on the field showed a skin which had developed on the surface from the impact of rain and slumping. This prevents further rainfall from percolating the soil and adds to surface runoff. The finer soils from the hedgerows are darker in colour, crumbly and undisturbed by machinery. These soils are fed by organic matter which helps to bind the soil together and make more stable aggregates. ‘The secret’s in the soil’ – we will be more likely to buffer the extremes of climate and drought if we can make land act like a sponge. We need to be able to measure how much water is stored in the soil in order to improve understanding of the importance of soil structure for NFM. Thank you to Sabine, Joanna and all the other facilitators for organising and running this site visit, including printing out driving instructions to each site, and providing tea and coffee at lunchtime! I really enjoyed getting to see what techniques were used in this project and learning more about what other people thought about current topics including NFM and local partnership engagement.